Up after 6:00AM and I went to sleep early… If this keeps up, in a few weeks I won’t wake up at all. Things are well at La Casa. The remodel is pretty much a wrap. We actually spent a few relaxing hours in the living room last night reading. I found a paperback on the shelf called “Saucer” by Stephen Coonts. He’s a popular author, but I don’t recall reading anything by him. I’m enjoying the book so far, and I guess there’s a sequel, which I will put on my iPhone Kindle App for the road. But this post is supposed to be about writing IQ2 isn’t it? Yep. One of my daughter’s favorite quotes from me about writing is: “Watching someone write for a day would like be watching someone dream for a night.” Meaning that writing is not exactly a spectator sport. Normally I would be scratching the rest of IQ2 in a Moleskine journal with my Mont Blanc pen, but I can’t afford that luxury because I have promised to have this book finished by the end of this (short) month, which gives me (counting today) 18 days to finish. And during that eighteen days I will have some chores to do down here, we have to drive to Phoenix (7-8 hours) next week, fly to Portland the following morning, and when we get back to the farm we have to put the house back together, because while we were gone we had the wood floors refinished, and all of our furniture (including rather large upright piano) is jammed into our bedroom. Oh, and on the 25th or 26th Marie and I fly to Reno to speak at the Nevada Reading Conference. And this is how 18 days turns into 12 days, and that’s if I’m lucky. As a result I don’t have time to transcribe the words from the Moleskine to the computer…but that is certainly my preferred way of writing. 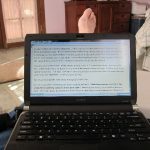 I’m writing the last part of the novel directly into the computer. But I do carry a small Moleskine in my back pocket, which allows me to work on the book if I happen to be away from the laptop. I also have a digital recorder on my iPhone, which I use if I’m out walking and I think of something that needs to be put into the book. I’ve made this point before in other posts, and when I speak… If you want to be a writer you must carry your books with you wherever you go. This is the same theory I have about taking photos. I carry a very small, and very good digital camera in my pocket wherever I go. If you can’t put the camera in your pocket comfortably you won’t use it. You’ll see something and you’ll say… “Darn I wish I had my camera.” Of course, there is also a camera in my phone, which I use in pinch, but camera phones are not nearly as good as a dedicated digital camera. Oh, and I might as well tell you which camera I use… I’ve owned several. But my favorite is the “Canon PowerShot SD780 IS Digital Elph.” The quality of the photos and videos are absolutely fabulous. It stores information on an SD card, which slip right into my computer for easy drag and drop. I heard from my I,Q editor yesterday, Judy Gitenstein, saying she has cleared the decks for the end of February to edit I,Q2. I also heard from Heather Hughes, President of Sleeping Bear Press. (And yes, her name is in the I,Q series. In the novels she’s the president of the record company Blaze and Roger work for). Heather said that they too are ready to get to work on this manuscript as soon as it lands in their offices. So here’s what happened today… Caught up on a bit of email. Started this post as I drank enough coffee to get my eyelids open. Worked on the book. Took a break to go on a walk with Marie, because when we get back up north and the winter weather our walking days will be limited. Ate breakfast: 2 hardboiled eggs and tortillas. (I’m going to really miss the eggs down here, which are fresh. And the tortillas, which are even fresher). Moved the laptop into the bedroom and my now famous Coleman cooler table. If all goes well I will remain here most of the day working and we’ll see how many pages I get in before I knock off for the day about 5PM or so. To help me stay focused and to block out the many little projects pattering outside the door I’m wearing noise cancellation headphones and piping jazz into my brain. I’m at a critical spot in I,Q2…everyone is in grave danger. I have to save them…well…some of them. Ziv, Malak, and Eben Lavi put on what Ziv calls, “…some terrorist theater.” A well known character gets shot. I hope you enjoyed the first chapter I posted yesterday. I haven’t seen any comments. And I have to say I’m a little bit disappointed at your response to my P.K. Quiz from the day before. There were only a couple of good guesses… Both wrong I’m afraid. Surely someone out there can get this one-question quiz correct. And if you get a chance let me know what you think of the first chapter of I,Q2. Bingo! You got it. PK = President’s Kid. And don’t worry. I’ll be back up in that mess next week. My name is Christian “Mikey” McClain. I’m a thirteen year old aspiring writer. I write mystery novels as part of my home school studies. I’m so excited for I,Q 2, and will buy it the DAY it comes out! I hope someday to shake your hand and thank you personally for all that you do.